Well, attached properties, just like normal properties are an object of Dependency Property, but with a very special point embedded into it. Even though the attached properties can only be added to a class which inherits from DependencyObject and also the property where it is attached to should also be a dependency property itself, an Attached property in WPF stays out of the actual object where it is attached to. For example, Canvas has two attached property that we can use while defining the Left and Right of the controls inside it. We can use Canvas.Left and Canvas.Right, both being an attached property. An attached property extends the the object behavior in boundaries outside it. Let us try to create an attached property and place it in as a behavior to another object. Let us say we use Attached Property to implement the RotateTransform behavior of a control. Let us take a look on what we are talking about. 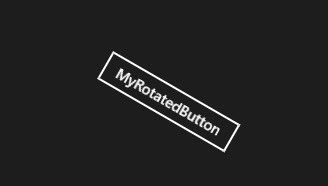 The Button hence created will rotate by 30 degrees. A Static method for Getter. A static method for Setter. A DependencyProperty registered as attached. Now in the code above, the public static Setter and Getter is needed, such that we can access the property from code. Remember, the PropertyValue is actually associated and/or resolved directly from inside of the object where it is attached to. So we need to pass the object where it is attached to and call GetValue or SetValue from inside the static getter or setter to do the needful. The DependencyProperty.RegisteredAttached will allow this double value to be added to the RenderTransformManager. Wait, well, if you run the code above, nothing will happen, because we didnt added the behavoir to the actual object. So lets redefine the attached property again with OnAngleChanged event. Now you can use local:RenderTransformManager.Angle=”200″ on any control that inherits from DependencyObject. I hope you can now define and use Attached properties yourself in code.